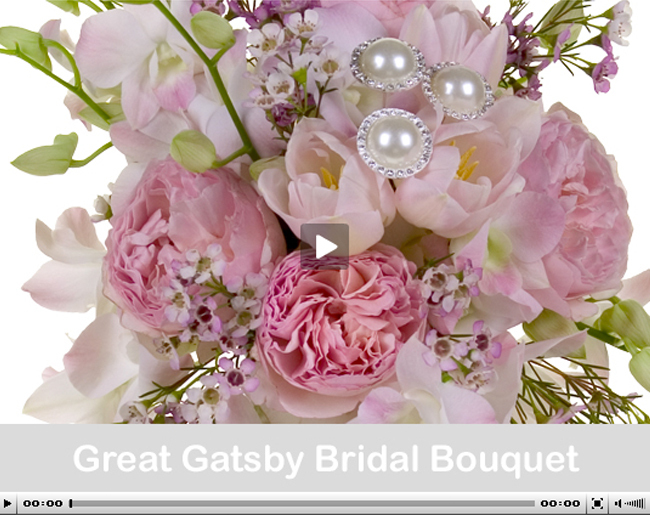 Leanne, from the Floral Design Institute, is going to show you how to create this fabulous wedding bouquet using wholesale flowers from FiftyFlowers. Leanne decided to use our Shop by Color feature and choose a gorgeous assortment of Blush and Pink Flowers, but you could also browse our Ivory, Butter Yellow, Peach or Lavender Flowers. Remember, soft colors will work best with this theme! Wholesale Flowers used in this bouquet – Blush Dendrobium Orchids, Blush Tulips, Miso Pretty Garden Roses, and Assorted Color Wax Flowers. Gorgeous, Lush, and Garden-y, with just the right amount of Bling…so Pretty! And So Perfect for this Great Gatsby style! Save on Vintage Wedding Flowers!